Be sure to get those last minute holiday orders in by noon Central time today and choose UPS Next Day Air to ensure a Dec. 24 delivery! And remember that through today, Friday Dec. 21 (noon Central time), you can save up to 25 percent on your favorite things from Drum Corps International. 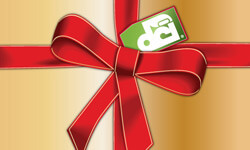 From DVDs, to CDs, to logo apparel, and more, the DCI online marketplace is stocked with hundreds of great holiday gifts for 2007. Order today online at store.DCI.org or by calling 800.495.7469 x3.